The average family spends more than half of its annual household energy bill on heating and cooling. That’s a significant number! By maintaining and making some appropriate improvements to your home’s thermal barrier you can dramatically reduce these costs. According to the Department of Energy (the DOE) you can reduce these costs by as much as 30% to 40%. “Thermal Barrier” refers to the systems and materials that help maintain a comfortable environment for your homes living space. Your home’s Thermal Barrier is comprised of its doors, windows, exterior siding, gutters & insulation. The first place to gain energy savings is by tightening the Thermal Barrier through weather-stripping and caulking to eliminate air leaks. Warm air creeping into your home during the summer and escaping out of your home during the winter will waste your energy dollars. One of the best energy saving projects is to caulk, seal, and weather-strip all seams, cracks, and openings to the outside. The DOE indicates a possible savings of as much as 10% on your heating and cooling bill by reducing the air leaks in your home. Once your Thermal Barrier is tight you should look at your insulation. Check the insulation in your attic, ceilings, exterior and basement walls, floors, and crawl spaces to see if it meets the levels recommended for your area by the DOE. Insulation levels are measured by R-Value. 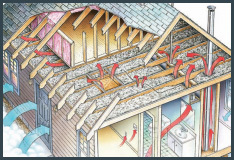 R-Value is an indication of insulation’s ability to resist heat flow. A high R-Value indicates a better insulating performance and therefore a more effective Thermal Barrier. If you have an older home and haven’t added insulation, if you are paying high energy bills or if you have been uncomfortably cold in the winter or hot in the summer, adding insulation will help. Increased insulation will decrease energy usage, create a more uniform temperature in your home and increase comfort. The “Insulate Colorado” program provides homeowners in certain Colorado counties, with a rebate to insulate and air seal their home to address rising energy costs. To be eligible for the rebate your insulation must be installed by a participating Colorado contractor. That’s a good reason to have a professional do this job. If your windows are newer, less the 5 years old, and generally in good shape, it will probably be more cost effective to boost their efficiency by weather stripping. Otherwise strongly consider upgrading your inefficient windows and doors. Windows & doors can be one of your home’s most attractive features. Windows & doors provide views, day lighting, ventilation, and solar heating in the winter. Unfortunately, they can also account for 10% to 25% of your cooling and heating bill. If your home has single-pane windows, as almost half of U.S. homes do, consider replacing them. New Energy Star rated double pane and triple pane vinyl windows with high-performance glass are available on the market. In Colorado we have both cold winters and hot summers. Select windows that are gas filled and equipped with low emissivity (low-e) coatings on the glass to reduce heat loss in winter as well as windows with spectrally selective coatings to reduce heat gain in the summer. Installing new, high-performance windows especially new triple pane, will improve your home’s energy performance. While payback takes a few years, the benefits of added comfort and improved aesthetics, home value and functionality should make the investment worth it to you. Additionally window prices as well as energy costs will continue to rise. Investing in efficient windows & doors now can pay large dividends in the future. Even the most energy-efficient window must be properly installed to ensure that its energy performance is achieved and that it does not contribute to a home’s moisture problems. Therefore, it’s best to work with a knowledgeable window contractor that can help evaluate your needs and professionally install your windows. The exterior finish of your home is your first line of defense against the weather and moisture. Evaluate the condition of your siding and gutters. Depending on the make-up of your siding material, the maintenance required to keep your exterior walls weather and water proof will vary. Surfaces requiring paint should be inspected for deterioration, cracks in joints, popped nails and raw plank ends. Appropriate repairs and paint prep should be completed before paint touch-up or a complete paint job is undertaken. Vinyl and steel siding should be inspected for dents, and loose fasteners. Easy to maintain it is important to keep your vinyl or steel siding clean and weather tight. In all cases make sure your downspouts and gutters are clean, properly sloped for drainage and fixed firmly to your house. Consider installing gutter protection to help keep gutters clean and flowing. Uncontrolled water flow from your roof can cause moisture to seep into your walls and foundation. This will significantly reduce the efficiency of your Thermal Barrier (wet insulation becomes less effective) and creates the possibility for the growth of mold within your walls. Your home should be sealed and insulated. Your windows, doors, siding and gutters must be in good repair, weather tight and moisture proof. The rising cost of energy, the newly available technologies that provide better efficiencies and current government rebate program create powerful reasons to improve your Thermal Barrier now! If you like to fix things around the house, you can deal with many of the projects that we’ve recommended and make the most of your Home Energy Savings budget. However, don’t hesitate to call a professional for help if you’d rather not do the work yourself. The dollars gained through energy savings in upcoming years will be worth the expense. As a bonus, these projects can extend the life of your home and may increase the value of your property.